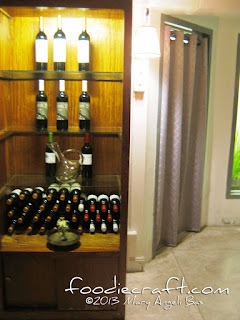 Cap off your bustling day with a pleasant combination of tannic wines, yummy comfort foods and serene music. Look for the wide parking lot with a grassy area accentuated with a fountain and crowned with a white two-storey abode. This was once a home that now functions as a place for stomachs that desire to be stuffed. 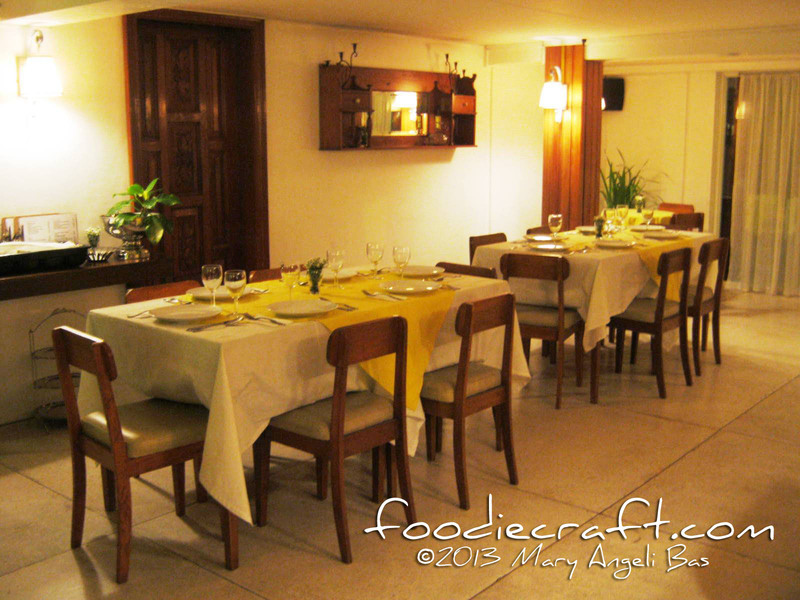 Two restaurants utilize the place; the second floor serves French cuisine while the first floor, Cellar De Oboza, serves Filipino-Spanish Cuisine. 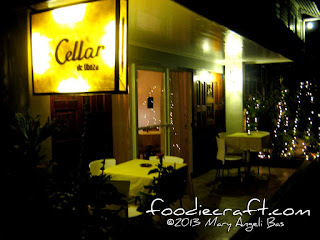 Cellar De Oboza is a dream-come true for a married couple- both of which never had culinary lessons in their younger years but have always loved to share their concoctions to adventurous stomachs. 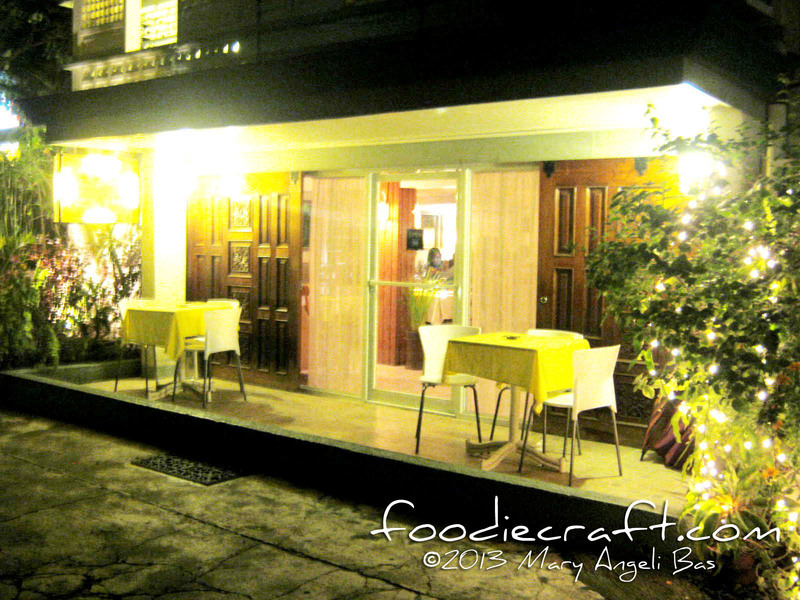 Inside is a palpable simple setting of a restaurant where yellow lights set a cozy ambiance and relaxing music play in the background. Cellar De Oboza has impressed me with some of its finger foods. Though easy to make, it was them who introduced to me that ingredients easy to find in the fridge, prepared in some manners we never thought of applying because of its simplicity, could make up a good bite. Shrimp Ceviche is cleaned raw shrimp tossed with tomatoes, red unions, garlic, chili and swiveled with vinegar, extra virgin oil and drizzled with lemon. The vinegar does the cooking of the shrimp. 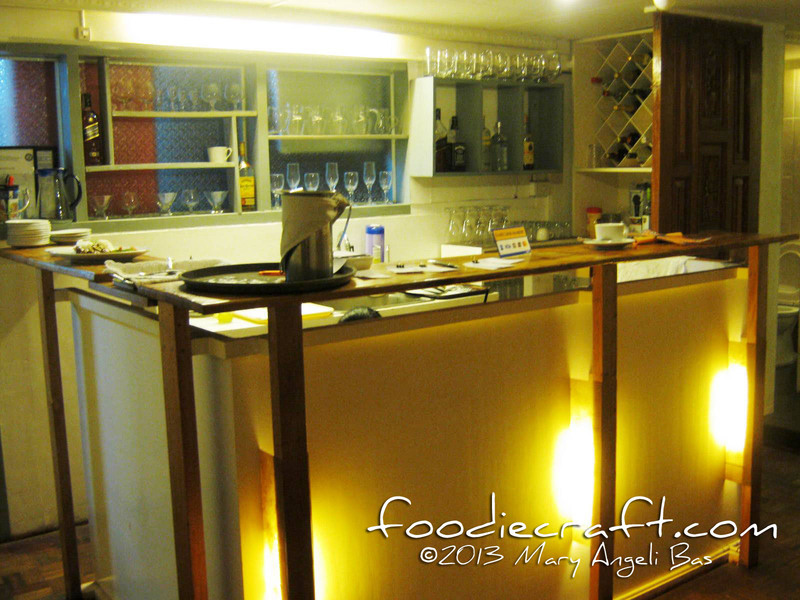 Their Ceviche was well done. I like the taste of it. 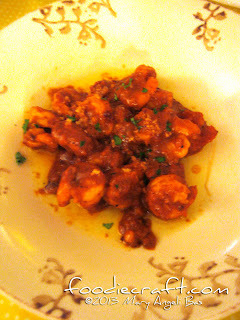 The shrimps weren't rubbery and the rest of the ingredients showed its taste without overpowering each other- well spiced-up. 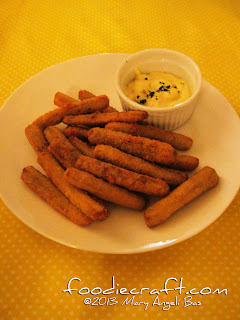 The Eggplant Frito is eggplant cut into sticks, coated with cornstarch, egg and finally, breadcrumbs and then deep-fried. The dip is Ali Oil, a Spanish condiment primarily composed of garlic clove, olive oil, American Lemon and mayonnaise. I like this dish. It was plainly yummy, very chewy and just delicious. The strong taste is traced from, not the eggplant, but its coating but more to the dip. Shrimps in Crab Fat Sauce is a bunch of shrimps marinated with lemon juice and fried with olive oil, garlic, onions, and red bell pepper. 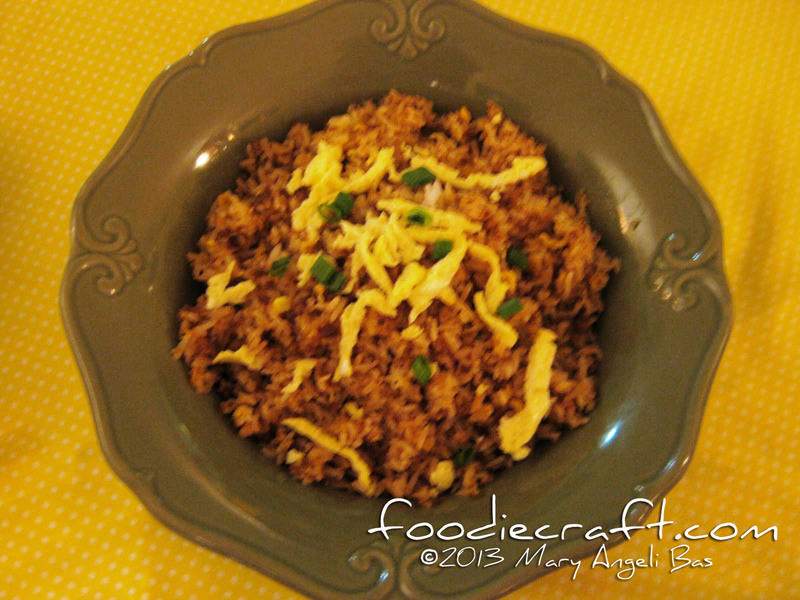 It is stirred with Crab Fat (sauce only) and served once simmered for a few minutes. U.S Angus Beef Belly Sisig is American Angus Beef cooked with onions, ground black pepper, ginger, soy sauce and chili. 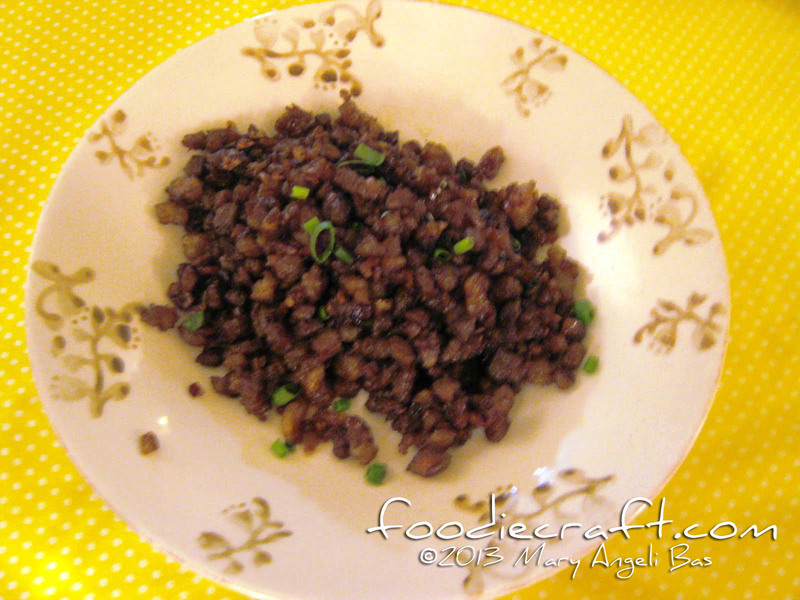 It basically follows the common recipe of making a sisig only that it uses American Angus Beef. 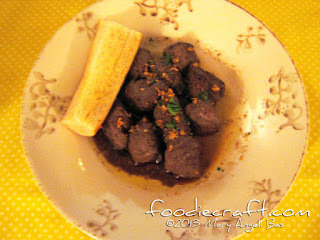 I don't like this dish so much maybe because I'm already used to devouring sisig not made out of American Angus beef. I think it's also because of the way it looked like. 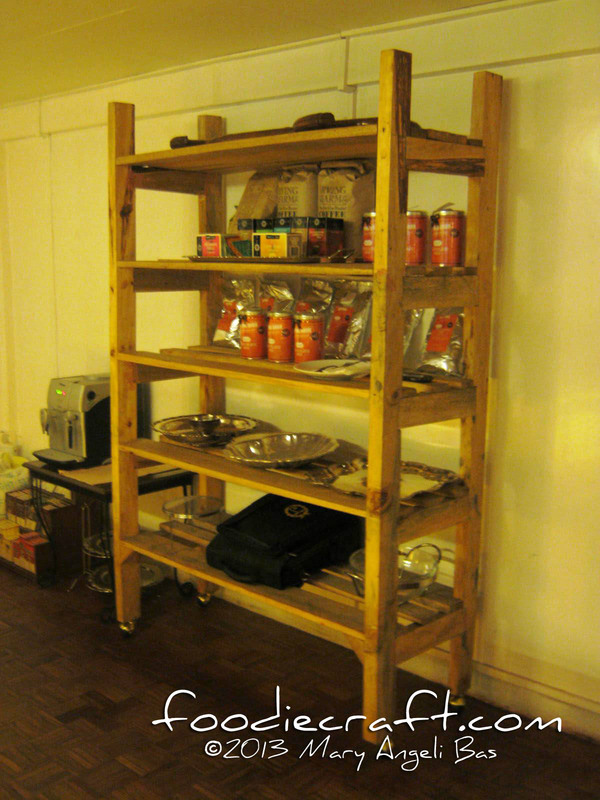 I find the presentation boring and like, done for the sake of just giving out what the customer wants. I would have appreciated the dish better if it was served with more ingredients like egg, bell pepper, lemon etc to enliven the flavor of the dish more and presented on a sizzling plate. Chorizo Fried Rice is simply fried rice with homemade Spanish Chorizo. 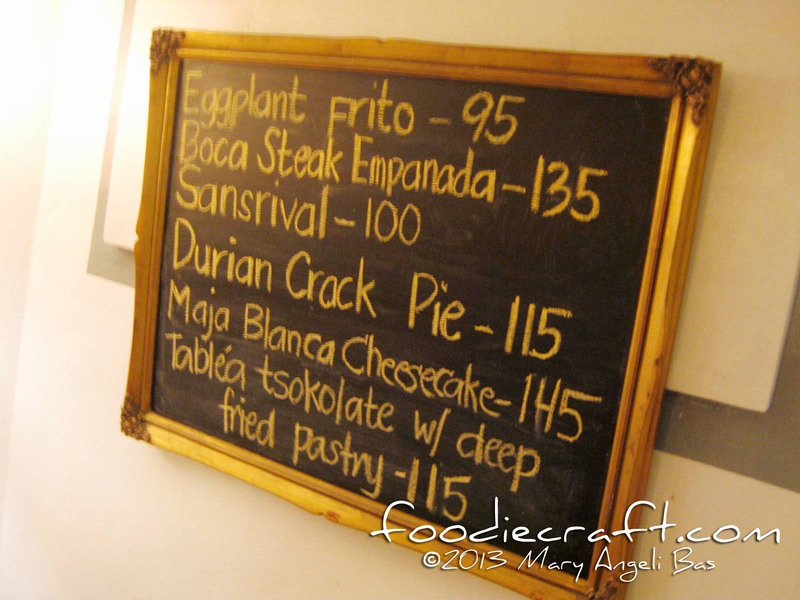 Like the description, the dish was simple. There was nothing so special about this dish and nothing bad to cite as well. 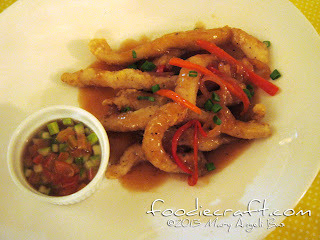 Fish Sticks in Guava Tamarind Sauce is Cream Dory covered with battered milk, eggs and water and then deep fried. It is topped with Guava Tamarind with serves as the sauce of the dish. Pickled salad is also added to the plate with a separate container. I don't have much appreciation to this dish. 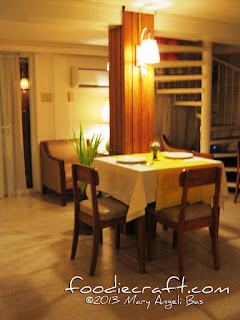 The fish's tenderness wasn't good enough for me and the sauce didn't taste good. I don't understand how I was supposed to grasp the taste of the sauce combined with the pickled salad. 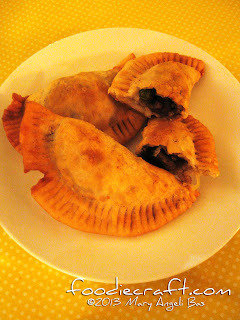 Steak Empanada is empanada dough stuffed with beef tenderloin, green peas, white onions, oregano. I love this empanada. Although I wasn't able to see the inside if the stuffed ingredients were equally spread, I can say that all of it nicely put inside. There was no part where I had so much of an ingredient in one bite. I had more than two of this food. Beef Salpicao is beef tenderloin marinated with soy sauce, salt and pepper. 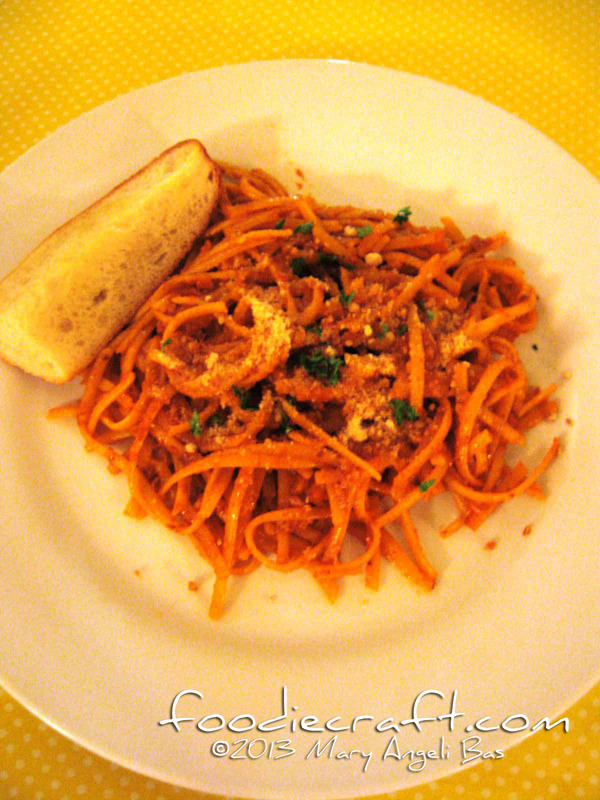 It is cooked with garlic, olive oil, and kalamansi. 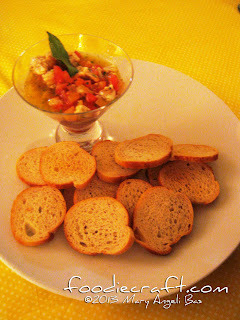 The dish is presented with a slice of French bread. 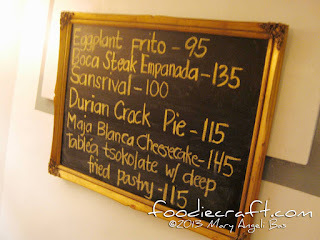 This dish was nicely done but I found nothing special in it. 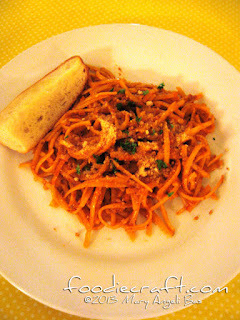 Talangka Pasta is pasta infused with crab topped with crispy garlic and parmasean cheese, served with a french bread. This dish came in so attractive to me but when I tasted it, there nothing to commend aside from the fact that is was good- the kind of good that's common in spaghetti-serving restaurants. 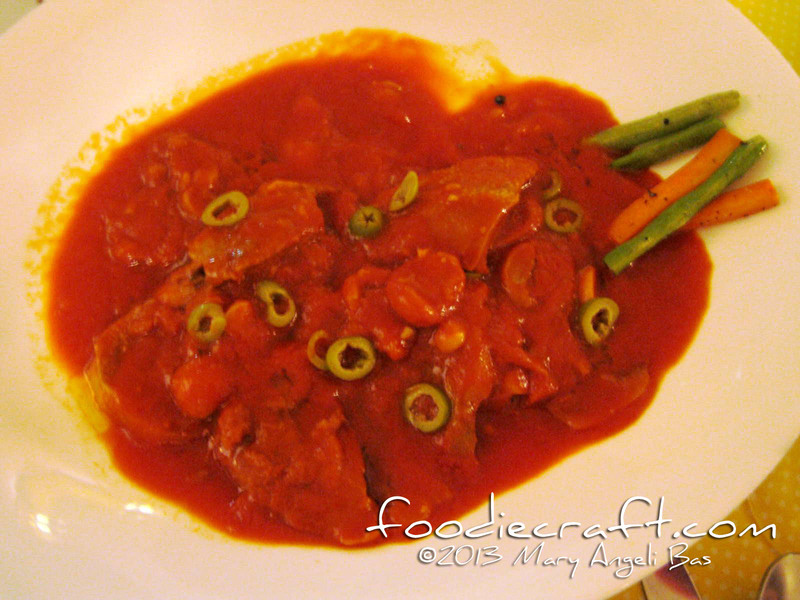 Lengua is ox tongue cooked with mushrooms, spanish chorizo, greens and a lot of tomato sauce. 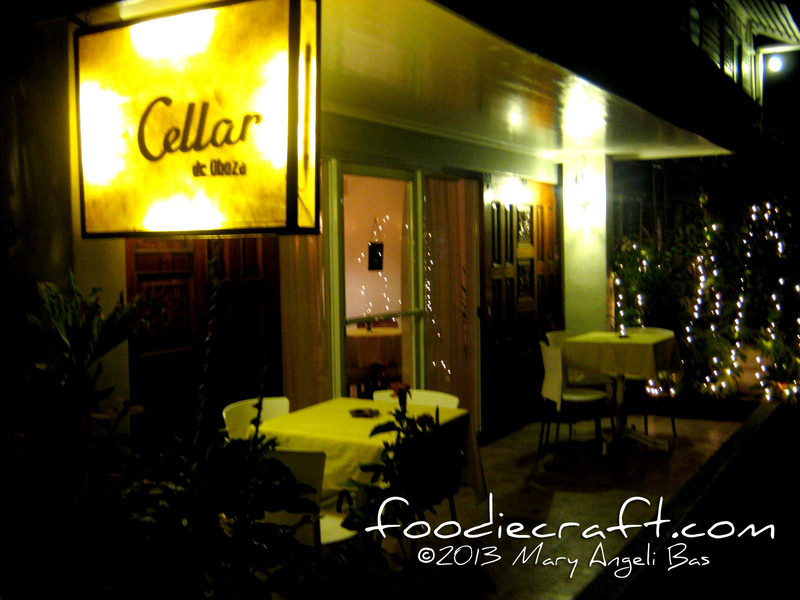 Cellar De Oboza is the place to be whether you are in for an inventive or a familiar dish. Cellar De Oboza is open from Monday to Thursday at 11am - 12am and Friday to Saturday at 11am - 2am and caters special reservations on Sundays. 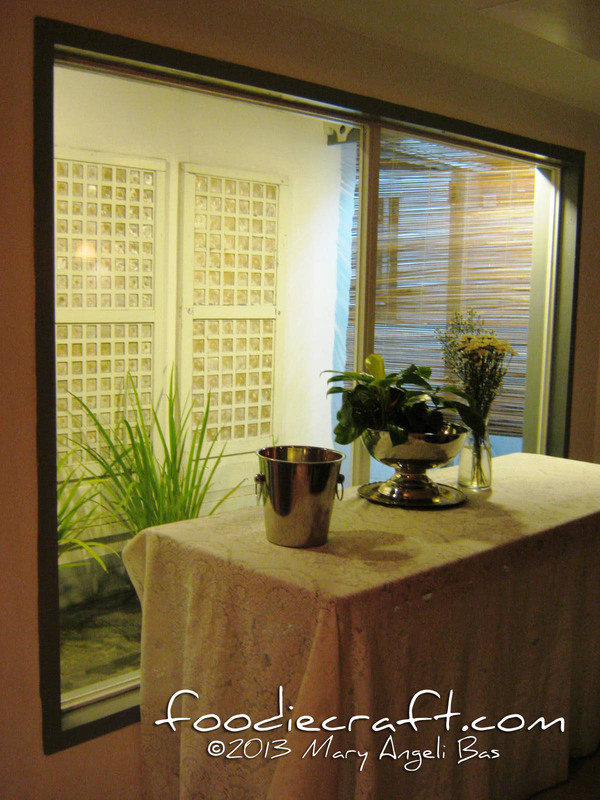 It is located at Oboza Compound, 143 J. Rizal Street corner Ponciano Street, 8000 Davao City. For inquiries, call or text 09823035183.